Faster Rendering with TrueVelocity 2 – 2nd gen. native 64-bit video engine delivers even more rendering speed. OpenCL for Optimal Video Effect Speed -- Harnesses GPU power for greatly improved video effect speed. Intelligent Rendering with SVRT -- Analyzes an entire project, chooses best output profile for production speed. Pro-Quality HD Editing -- Edit with a huge variety of tools, transitions and effects on a flexible 100 track timeline. 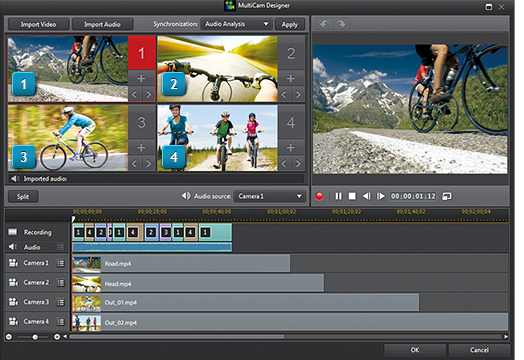 Powerful Core Tools -- Crop and rotate videos or precisely trim footage with PowerDirector’s Zoom-in Cut™. One-Click Fixes -- Instantly correct lighting, shakiness, artifacts or upscaling to HD with TrueTheater enhancements. Import All the Latest 3D Formats -- Either from files or straight from 3D cameras/phones. Edit it All in 3D! – Enjoy a complete 3D editing workflow including 3D titles, disc menus, transition effects and more. Output to 3D Formats -- Burn your project to industry standard 3D Blu-ray, 3D AVCHD or 3D DVD discs. 200,000+ FREE Effects -- Find the perfect effect, template, or DVD menu to set your project off. Learn with Tutorials & Timelines -- Get the most out of your software with tutorials & timelines uploaded by others. Sharing Made Easy -- Share your work to video sites like YouTube, Facebook, Vimeo, Daily Motion and more.